The Kitimat Modernization Project, the $3.3 billion upgrade of the Kitimat aluminum smelter will create capable and competitive contractors that can go on to work at the future energy developments in the region, Rio Tinto Alcan CEO Jacynthe Côté said Thursday, March 8. Côté was in Kitimat to tour the region, a trip that was postponed in December, at the time of the “Notice to Proceed” on the modernization project, when her aircraft was diverted to Prince Rupert by a snow and sleet storm the day of the announcement. During a dinner on Wednesday night, Côté met with leading contractors, the leaders of the Haisla First Nation, Mayor Joanne Monaghan and members of the District of Kitimat Council. 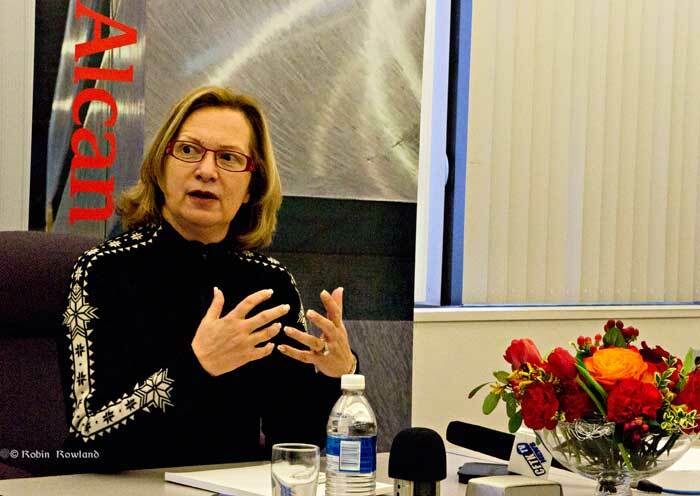 The prospect of future energy projects, three liquified natural gas terminals to be built by the KM LNG partners, by the BC LNG partnership and by Shell was one factor in Rio Tinto Alcan giving the go ahead for the modernization project, she told local reporters. Michel Lamarre, Director of KMP said that despite some delays due to the harsh winter, RTA is still aiming for first concrete at the new potlines on June 1. First new metal is scheduled for the second quarter of 2014. Peak employment, about 2,500 people, is expected to be in the first quarter of 2013. “We have the ambition to make the project a real showcase, for us, for British Columbia, for Canada,” Côté said. “So we’re pretty proud that 62 per cent of the work done so far has been done by the community in the area., 95 per cent of them in British Columbia, which is absolutely spectacular for a project of that complexity and magnitude. She says that RTA is spending $3.1 million each day on the modernization project. Asked about both the prospective LNG projects and the fact that accommodation in Kitimat is now at a premium, she said that “crowding” was a significant part of her discussions with both the Haisla and the District of Kitimat. When Royal Dutch Shell Canada purchased the Methanex/ Cenovus Energy plant and marine terminal in Kitimat Wednesday, company spokesman Paul Doolan told the media that Shell “is now exploring the potential for an LNG export terminal on the site,” but refused to give any time line for the project. Now sources have confirmed to Northwest Coast Energy News that at this time it looks as if there will be no major developments in the Shell project until 2015. Employees of Cenovus were told after the sale announcement that the plant’s condensate operations would be “business as usual” until sometime in 2015. As anyone who has gone through a takeover or similar management transition knows, a company’s new management may have ideas that they haven’t discussed with the old regime. The 2015 date is logical, however, since 2015 is the projected launch date for the first project, KM LNG partners’ Kitimat LNG project. There are already two projects in the “pipeline” so to speak, the Kitimat LNG and BC LNG projects. As discussions during the June National Energy Board hearings that led to the approval of the KM LNG export licence last week showed, the two companies must come to an agreement on some of the pipeline capacity coming into Kitimat, sharing “the molecules,” that favourite phrase of natural gas analysts. Shell will also have to go through the National Energy Board process for granting an export licence. With energy companies rushing to exploit the shale gas resources in northeastern BC and in Alberta. 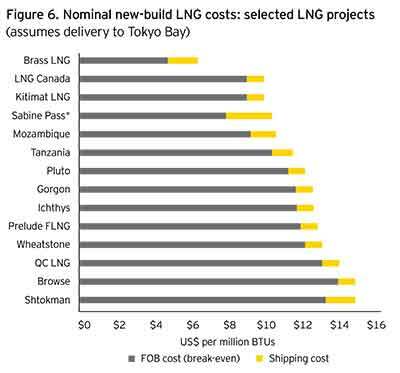 and growing demand for the natural gas in Asia, transportation of the natural gas is a big question, since it appears Shell and its partners will have to build new pipelines since the existing pipelines into the Kitimat region will be at full capacity. Where will that new pipeline be built? How will that new pipeline be built? That question is already being widely debated in Kitimat. Ever since Enbridge has announced that it too is interested in joining the natural gas export boom, the question has been: could a natural gas pipeline replace the proposed Northern Gateway bitumen pipeline or does Enbridge intend to build two pipelines? If it is the latter, Enbridge, and possibly Shell, can expect years of hearings, protests and delays because while people in northwestern BC are generally accepting of natural gas projects, there is fierce and still growing opposition to the bitumen pipeline. 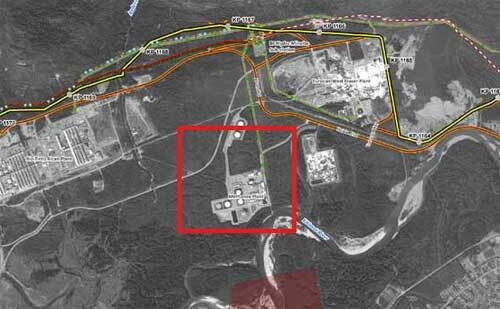 The former Methanex site is seen the red square in this map of the Kitimat service centre prepared by Enbridge as part of its Northern Gateway pipeline proposal and filed with the Joint Review panel. The yellow line is the proposed Enbridge bitumen pipeline. The dark red line is the proposed pipeline that would feed the Kitimat LNG and likely the BC LNG projects, where the red pipeline route has white, that is the Pacific Trails Pipeline. See How Kitimat harbour will look if both Northern Gateway and KM LNG go ahead. Monaghan said she met with Shell executives on Wednesday afternoon, when the long rumoured purchase of the Methanex site was confirmed. also acquired the Kitimat Marine Terminal. 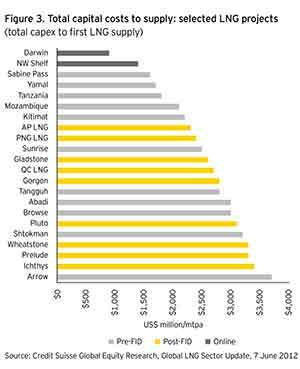 Shell’s partners include Korea Gas Corp, Mitsubishi Corp and China National Petroleum Corp, Doolan said. Both sites were owned by Cenovus Energy which purchased them in 2010 from Methanex for a reported $40 million. Monaghan also said that the Shell officials said the company will not be making an announcement of the details of their plans for another few weeks. If the Shell project goes ahead, it will be the third liquified natural gas project in Kitimat. The others are KM LNG partners’ (Apache, Encana and EOG) Kitimat LNG plant at Bish Cove and the smaller project from BC LNG. methanol to supply customers in western Canada. Cenovus uses the terminal and site to process condensate, used to dilute bitumen, that arrives by ocean tanker and then is shipped by rail to Alberta. The future of condensate operation has been in doubt since the announcement of the Enbridge Northern Gateway project, since it was expected that the Cenovus condensate operation would have been absorbed into the Enbridge operation. If the Methanex/Cenovus site is converted to a full LNG facility, current operations will have to be decommissioned first, Monaghan said. Multiple sources in Kitimat have been saying for the past month that Shell had purchased the Methanex site, but official conformation only came from the mayor late Wednesday.